It came as a surprise to many of my friends that I had never cooked artichokes until a few weeks ago. Here in California artichokes are kind of a staple, like avocados. In fact, nearly all artichokes in the U.S. are grown in this state (I just learned that). However, my parents were raised in New York so we just never really got into them at our house when I was growing up (avocados too, for that matter). So, yes, I’m new to cooking artichokes. For my first foray into preparing them I followed Elise’s guidance in this post on Simply Recipes and steamed them with garlic and lemon. It was so much easier than I’d imagined – I just trimmed all the little leaves with my kitchen shears, rinsed ’em and steamed ’em. I also love her suggestion of eating them with balsamic mayo, just the right sweet-acidic touch. After successfully preparing them Elise’s way twice, I felt confident enough to venture out into another artichoke prep method: slow cooker. As with many slow cooker recipes, it’s a real no-fuss option. You just dress the artichokes in garlic, olive oil and balsamic vinegar and let them braise in white wine for four hours. The balsamic vinegar in this recipe actually brings out quite a bit of sweetness in the artichokes. The garlic, after slow cooking, also becomes sweet, like when it’s roasted. I’m kicking myself for waiting so long to try artichokes, but better late than never, right?! Rinse artichokes well. Cut 1/2 inch off the top of each artichoke; trim the stem end so the artichoke stands flat. Pull the leaves open to hold the filling. Spoon 1 tablespoon of the garlic evenly between the leaves of each artichoke. Place artichokes in slow cooker; drizzle each with 1 tablespoon of the vinegar. Season with freshly ground pepper to taste. Pour wine into the slow cooker and add enough water to come up one-fourth the sides of the artichokes. Cook, covered, on HIGH 4 hours or until a knife is easily inserted into the stem end and the leaves pull away from the base. 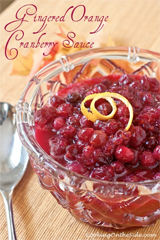 Remove from slow cooker and let cool slightly. 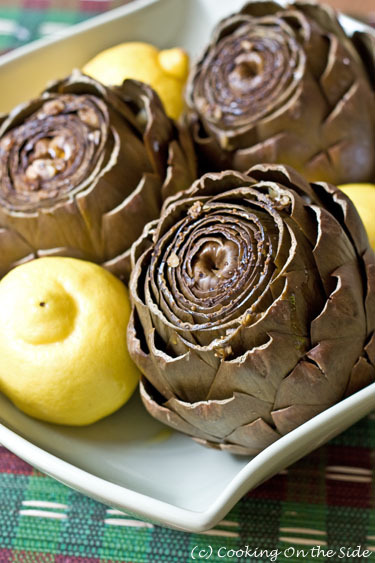 Drizzle each artichoke with 1 teaspoon of the oil, and serve. Mmm, I love artichokes. My parents took a motorcycle trip around the US back in the ’70s, and my husband and I drove from San Diego to the Redwood Forest and back last fall. I made my husband stop in Castroville (I believe about 90% of the artichokes in the US come from that area) to recreate my parents’ photo near the giant artichoke in town. I’d never thought of using a slow-cooker for them, though! I love artichokes! 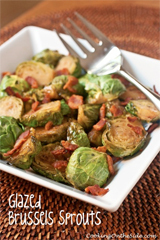 I can’t wait to try them in the slow cooker! 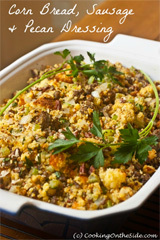 I’m making this recipe next week! love it! The slow cooker is by far my favorite kitchen appliance. This is a brilliant way to make artichokes. Love it! Oh wow! We have been looking for new slow cooker recipes and I am obsessed with artichokes. In fact, we only had two the other night and assuming the kids wouldn’t want one, the hubby only served me and himself (kids had burgers). My son burst into tears: WHY DON’T I GET AN ARTICHOKE?! Now, thanks to you, he will. And it will be amazing! These look amazing Kathy! I’ve never had artichokes but really, really want to try them. So glad you tried artichokes and are sharing! I haven’t cooked whole artichokes in a long time, but you have inspired me to try it again. Thanks so much, Jeanette. It was great to finally meet you last weekend! I used to be really intimidated by artichokes too. Once I cooked them a couple of times and realized how it easy it was, there was no stopping me. I can’t wait to try your slow cooker method. 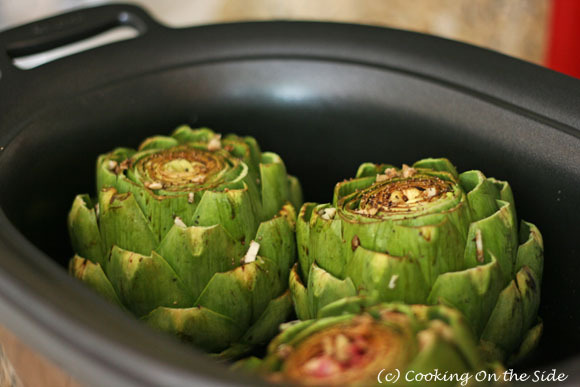 I love artichokes and love the idea of making them in a slow cooker! I love artichokes so I’m glad you posted about this. Can’t wait to try out your recipe! 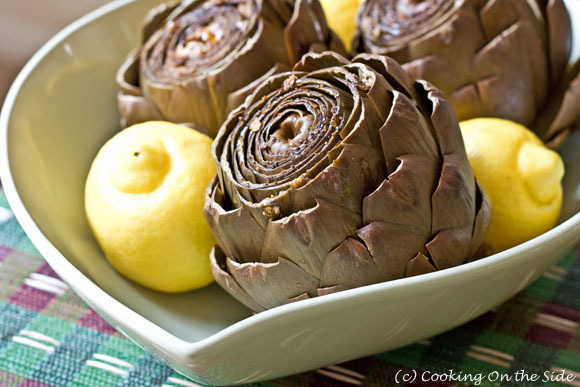 I love artichokes but now I need to drizzle them with evoo and balsamic! They sound so tasty that way! So interesting. I had no idea that artichokes were so California. But now that you mention it, I did find it weird that so many friends in the midwest hadn’t ever really eaten them, while I totally grew up with them! Trying out your recipe tonight! Tried the crock-pot version of cooking artichokes last night. Unfortunately, they came out awful! They were completely cooked, but took on a dark color and just didn’t look appetizing. I would be willing to try this again, using less water and minus at least an hour of cooking time. I’m sorry to hear that, Julie. Every slow cooker works differently – maybe next time a shorter cooking time will work out better for you. Previous post: Next Food Network Star Amy Finley’s “How to Eat a Small Country” ~ Review & Giveaway!